An excerpt from Chapter 8 of my web-novel LIBERATED ZONE, A Novel about Thinking about 1968, readable online at www.liberatedzone.com. Jimmy O’Shea has gone to ground in an apartment on Telegraph Hill to avoid arrest while his lawyer arranges the terms of his surrender. 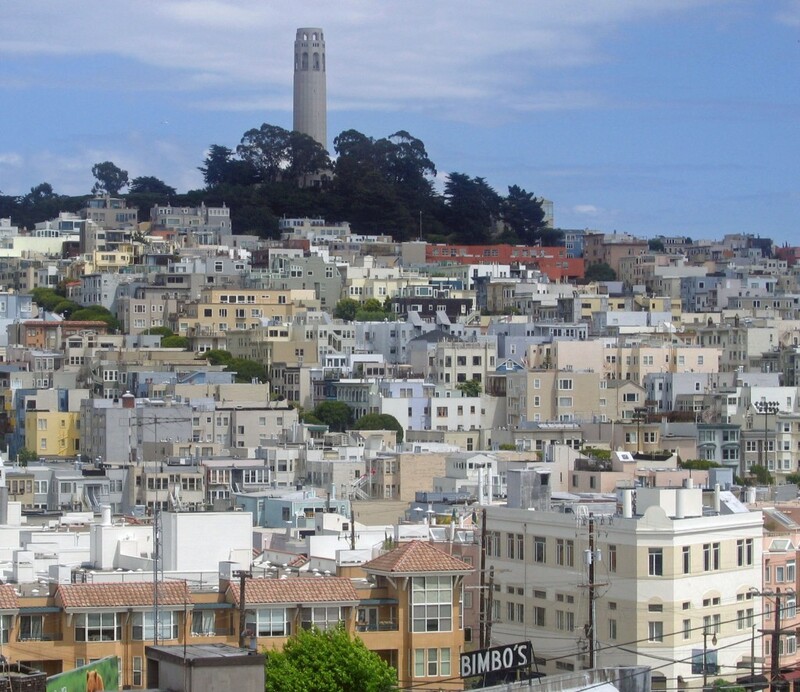 Why don’t we just hike up to Coit Tower, Jimmy? said Jimmy, they don’t look for fugitives there. How do you know if you are a fugitive? Has an arrest warrant been signed? Is there a photo on the wires? How many points are there in an all-points bulletin? Are there one-point and two-point bulletins? What is the number n, above which n-points becomes all-points? And what are points? Been here 12 hours. Psycho already. Climbing the street to Coit Tower drained the voltage from him, then at the peak the dull blue shockwave, the all-encompassing Bay. Two tourist couples by the rounded parapet. Who tours San Francisco in January? Sky the color of drywall, freighters aimed at and departing from the Bay Bridge, the Something Maersk and Something Else Maru, headed for Japan, for the Embarcadero. Alcatraz. Bare ruined. Does the pain growl on the tiers for its lost prisoners? Terrific therapy, Jimmy, hike up here and look at a prison. 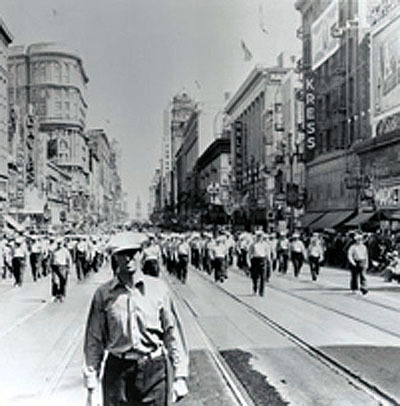 To the east, the waterfront, political spine of San Francisco, the docks its vertebrae, the ’34 General Strike its creation myth. EXT. CALIFORNIA COUNTRYSIDE. NIGHT. JULY, 1934. A locomotive pounds the desert rails, its single headlight cleaves the dark. Drive wheels churning, it passes us in a cloud of steam. INT. A BOXCAR ON THE TRAIN. WALTER O’SHEA, 22, not yet Jimmy’s father by a decade, struggles in sleep among bales and crates. The locomotive whistle screams. Walter, in rumpled clothes and dented fedora, stands at the deck railing. He looks to the West. San Francisco glistens in the morning sun. Bagdad-by-the-Bay. C. U. Walter’s face, unshaven, excited, hopeful. EXT. SAN FRANCISCO TRADE CENTER. DAY. Walter descends from the ferry to the dock. We follow him through the Ferry Building to the cobblestone street outside. Above and behind him we glimpse the partly completed Bay Bridge. EXT. SAN FRANCISCO EMBARCADERO. DAY. Walter shakes his head in disbelief, looks up at the clock on the building, shadowed by morning light. It says 9:10. He looks again at the waterfront. It’s empty. Where are the trucks, the workers, the traffic? Where is the pellmell of the biggest port on the West Coast? C. U. Walter’s face. He’s confused. The camera looks up and down the street. It sees figures in the shadows. A POLICEMAN stands in the center of the Embarcadero. A man runs across an intersection two blocks away. There are no cars, buses, trucks. Three policemen on horseback trot down Market Street, turn to Walter’s right, move north. WALTER walks south on the Embarcadero toward Mission Street. The POLICEMAN approaches him. WALTER continues to Mission Street, uneasy. At Mission and Steuart an old car turns the corner behind him, a man perched on the passenger side running board; the car pulls beside Walter, stops. Three men jump out. They are longshoremen. The one on the running board carries a lead pipe. They surround Walter. The film has become increasingly grainy, scratches appear. Now and then it goes blank, with splotches of scorched mildew. Hey, buddy, we’ll have a word with ya. Off the ferry he says. guys to Frisco these days. on. Maybe you do. I’ll give it to you straight. works is a scab. You do know what a scab is? The soundtrack rasps, words interrupted. Get to the part where we break his legs. Kid has to be educated. Kid looks smart. MAN hands WALTER a copy of the Western Worker. Now that you know the situation . . . .
See you scabbin we break your legs. Walter sits on a cot, looks through his wallet for a card, finds it. Brand-new press card: St. Louis Post-Dispatch. INT. 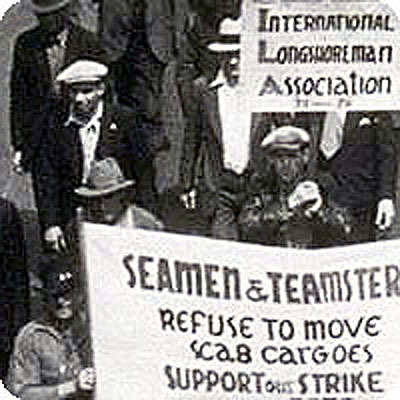 STRIKE HEADQUARTERS, INTERNATIONAL LONGSHOREMEN’S ASSOCIATION. A wooden room, a desk, two chairs. Behind the desk sits HARRY BRIDGES, head of the rank and file strike committee. In front of the desk is WALTER O’SHEA, notepad and pencil in hand. BRIDGES consults a file card. you. Corner of Mission and Steuart. mistreat you in any way? Harm you? They offered to break my legs if I came back. bound by his private actions. But there is an agreement. the police, on the strikers. They say the strike is led by communists. The only ists it’s led by are unionists. The film runs out in flashes of black specks and scars. It is replaced by 8mm color film in a handheld camera. INT. THE ANCIENT HOUSE IN ST. LOUIS. 1958. DAY. WALTER sits on the couch talking to JIMMY, 17, seated in a molded plywood Eames chair. The film turns to 16mm color in a camera on a tripod. EXT. THE GARDEN OF THE ANCIENT HOUSE. 1963. DAY. WALTER and JIMMY walk together, out-of-focus gladiolas behind them. to be careful about that. The sign on the Coit Tower doors neither confirmed nor denied the existence of hours open to the public. Jimmy knew there was something inside, dioramas, exhibits. He nudged the door open. A damp cinder smell, the coal-fired basement of the house in St. Louis. Aha. San Francisco known for its pinko art. Pinko seal in Sausalito. Pinko conquest of California in Rincon Annex, pinko St. Francis feeding birds somewhere. 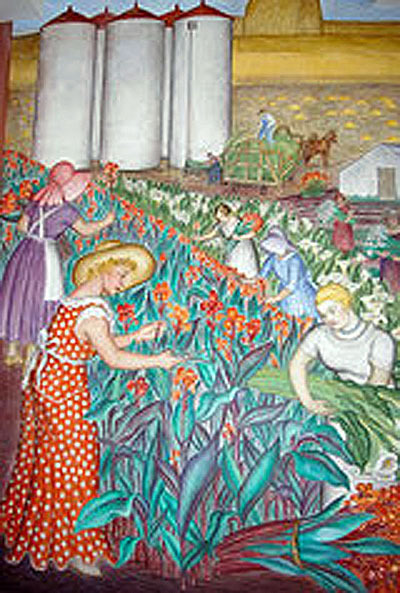 Jimmy slid through, faced serious maidens in sunbonnets gathering cala lilies by the armload before three silos like giant baby bottles in a field of yellow ochre, tiny horses, wheat like golden barns, farmworkers in polkadot dresses. He found the voice in an inner room, caretaker of some sort, staring at a pinup calendar. “Hi, name’s Jimmy. Last day of my vacation, walked all the way up, art’s no good huh? “Oh yeah, they can draw.” He heaved his Mussolini bulk from the chair. “I’ll show you what they draw.” He led Jimmy to a downtown street corner. Firmjawed teamsters loaded wooden boxes of Golden State produce, a blue cop made a call from a street box. “Look at that. What’re they selling at the newstand?” he asked. 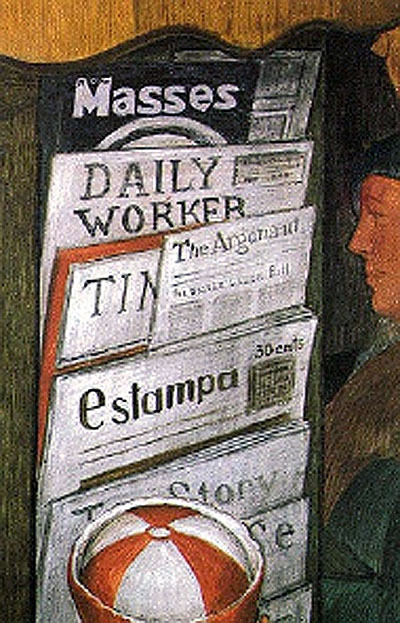 Masses, Daily Worker. Top Two on the newstand ratings. “See what I mean?” he said. “Waste of talent.” A man suspiciously like a self-portrait-of-the-artist glanced up at Jimmy from the display ofleft-wing papers. Jimmy strode through California circa 1934, past the mighty effluvia flowing down Shasta Dam past gold panners, hordes of solemn unemployed, libraries, printing presses, newspapers, typesetters, brakemen, switchmen, magazine readers, Brinks armored guards, back to the Ukrainian blonde haloed in lilies. The smell of age and bad care, as if the masses were stashed in a ripoff nursing home, moldy and underfed, and these were their memories, boneless, rounded flatly, like memory, here today, gone before, remembered only by the artists, rendered, dead. He started round again more slowly not to disturb the aged. Thirty-four years since ‘34. Murals painted halfway between me and the 19th century. Thirty-four years old then that grapepicker with the pipe in his mouth, sixty-eight now telling his grandchildren what a tough, idyllic, miserable, golden time that was. In the public library reading room the newspaper readers learned B. BUFANO’S ST. FRANCIS JUST AROUND THE CORNER. THOUSANDS SLAUGHTERED IN AUSTRIA. MORATORIUM IN NORTH DAKOTA. HOME FORECLOSURES, BANKS REFUSE. This must be art, you can read the headlines. World War II is coming but the guy reading the Western Worker doesn’t know it. Don’t get up, comrade, you have time. History has not yet broken out in Spain. A man in green, not a bone in his body (were anatomy classes counter-revolutionary? ), pulled from the shelf above his head what else! but Capital. I, Jimmy, recommend the section on the Working Day, good journalism. The bookshelf, containing works by Gorky, Strachey, and Ostranvanyan (who’s Ostranvanyan?) extended around a corner into a real, actual, existing-in-1968 window, which Jimmy touched to make sure, a thin three-paned window set in an alcove in the Coit Tower wall through which real 1968 sunshine leaked. Clever, a true-in-this-world-alcove lined with true-in-that-world painted bookshelves in skewed perspective so the man in green (another self-portrait?) could withdraw Capital at such an angle the viewer could read the author’s name, Karl Marx. productivity of it all. The massive dam you built, the water channelled, the power harnessed and transmitted, all in motion. A great earnest metaphor: let’s get the job done! Except for this longshoreman, sitting on the dock of the bay, pipe in mouth unsmoking, an uncertain item on his lap, who frowns, strains backward to look into the nonexistent-in-his-time window alcove. Comrades, I’m confused. These amber waves of yellow paint, the fruited mural walls, the brotherhood, this utopia of the present moment; even your unemployed look as if an actuarial mistake temporarily excluded them from the task at hand. Are you painting what you see should already have been had not what is occurring in your time taken place? Or is this what you think the future will be like ages hence, say in 1968? Why is no one screaming? What is not here? No one is beating his children, shooting dope, weeping because God betrayed him, molesting choir boys, cheating on his wife. There are no black folks here, (ah, there is one in the crowd of unemployed; the great inmigration from the South will take place during the World War you don’t know is coming). No one’s driving drunk, got the willies, the cold sweats, boils and diarrhea. No one’s dodging the draft. No one’s protesting racial segregation, no one’s thrown from a motel window in a drug deal gone bad. No one’s kicking their kid out of the house for accepting Buddha as his lord and savior king. No one’s being raped. No one can’t stop screaming. The longshoreman cannot see round the corner of the alcove. There is no alcove in his world; it’s a hole in his universe. We can see because we’re four-dimensional space creatures who understand that what he thinks is the San Francisco waterfront is actually the inside of a tower on a hill above the waterfront he thinks he’s in. We 4-D creatures who have travelled here from 34 years in the future can look in on his behalf, but by the laws of time travel and mural painting we cannot tell him what is there. So why does he strain, why does he suspect something is within? Inside the recess a man pulled a rope stiff with his neck, eyes purple and dead. No no no. No no. No. This is mural time. Black Mountain Bill lives in my time. Jimmy rubbed the plaque. Only dust from 1968 came off on his fingers. The dead face did not look like Bill, workingclass hero, wounded at Pearl Harbor, organized sugar workers in Hawaii, but why should it? Bill’s eyes don’t bulge, his face ain’t purple. Jimmy closed his eyes, flicked them open to catch the mural at its lie. The man who helped Jimmy pour sugar in the gas tanks of tractors being loaded for South Africa on Pier 18 hung there still. INT. A PIER ON THE SAN FRANCISCO WATERFRONT. 1964. DAY. C.U. Face of BILL MONTENEGRO, 44, creased, lean. Soft longshore cap, tilted. Camera pulls back. BILL walks past bales of cotton piled high in the shed. He smiles. POV; what he’s smiling at: Eric Hoffer, the right-wing intellectual’s longshoreman, pipe in mouth, old fraud, holding court in a cubby of cotton bales. At this moment, his only audience is JIMMY O’SHEA, one of those young radicals recruited by Bridges to the waterfront from the civil rights movement. BILL draws close to the pair. BILL swings his longshore hook into a bale near HOFFER’s head by way of greeting. Your advice to them is die? JIMMY looks at BILL incredulously. He yanks his hook out, winks at JIMMY, walks on. The man stuck his head in the alcove. No, he had not seen it before. If it had been there, he would’ve. It was new. Jimmy picked at the curled edge of the paper, which lay at the hanged man’s feet. A painted note upon a painted wall. “You’ve been a peach,” said Jimmy. He exhaled it, pee-ch, instead of ramming the caretaker’s head into the wall, splashing Diego Rivera earthtone blood on the railroad yardmen repairing the tracks to the left of the alcove, and could not bring air back into his lungs until he was outside and the sky rushed away in grayest vacuum. Say goodbye to the guys for me. And Jimmy O’Shea. Terence Cannon was a SNCC Field Secretary, editor of “THE MOVEMENT” and anti-war leader in the Sixties, a journalist in the Seventies, a college teacher in the Eighties, and a fiction writer ever since. He lives in Santa Monica.